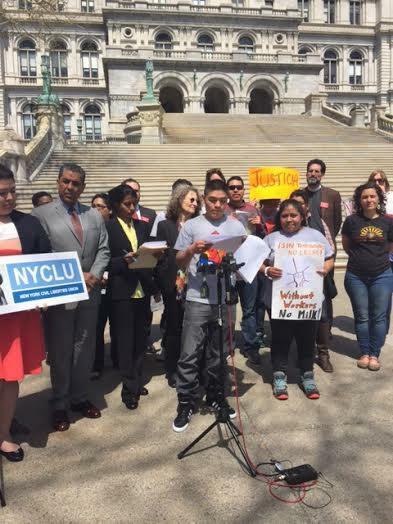 On Tuesday, May 10 Crispin Hernandez, a leader of the Workers’ Center of CNY, sued New York state and Gov. Andrew Cuomo for the failure to protect farmworkers right to organize. The governor immediately agreed with Crispin, the WCCNY and the Worker Justice of NY, also plaintiffs in the lawsuit. We are winning and getting closer to equality for farmworkers in NY! Now on Sunday, May 15 marks the Justice for Farmworkers campaign begins a 200 mile march from Long Island to Albany in support of the passing the Farmworker Fair Labor Practices Act, a bill of rights that will finally end the shameful exclusion of workers from the right to organize, the right to overtime and the right of a day off. We are all harvesting justice! The March for Farmworker Justice will end on June 1, on Farmworker Albany Day, when allies and farmworkers will flood the capital to demand equality: a harvest of justice for all workers. Solidarity March for Farmworker Justice in Syracuse! We will rally to celebrate the struggle for farmworkers rights in NY and we will march for justice and solidarity.